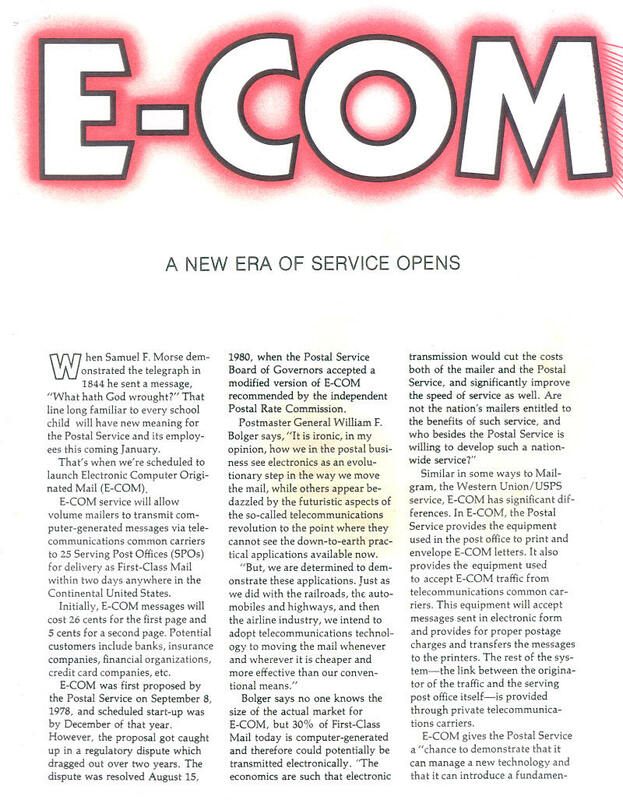 The November-December 1981 issue of the Postal Life announced the upcoming E-COM service, provided background information and history in E-COM's development, but also eerily forecast the seeds of its eventual demise in political haggling and lawsuits, as well as a pricing structure too high for the market. Also of note is the comparison of E-COM to one of its forerunners, Mailgrams. Click here for page 2 of the article. 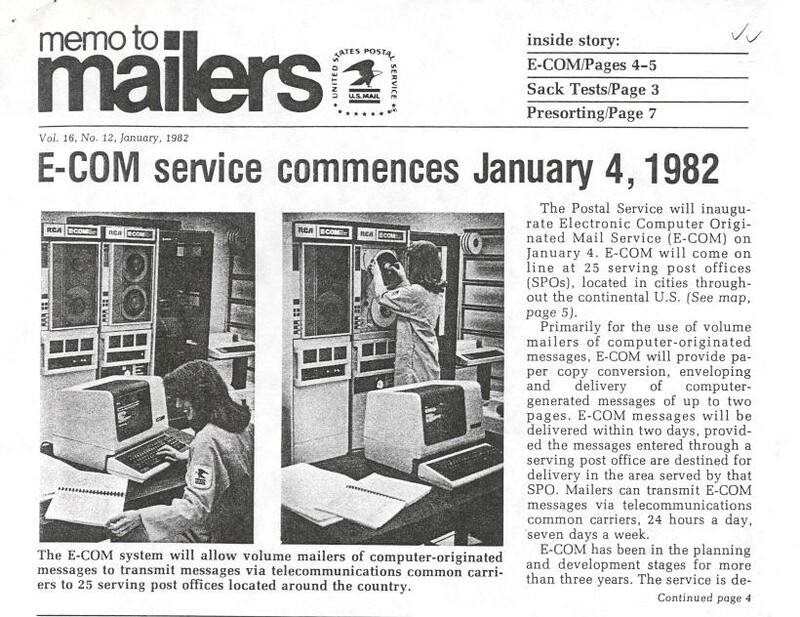 The January 1982 United States Postal Service (USPS) Memo to Mailers proudly announced the initiation of Computer Originated Mail Service, E-COM. This issue of Memo to Mailers also mentions the companies involved in the telecommunication aspects of E-COM. 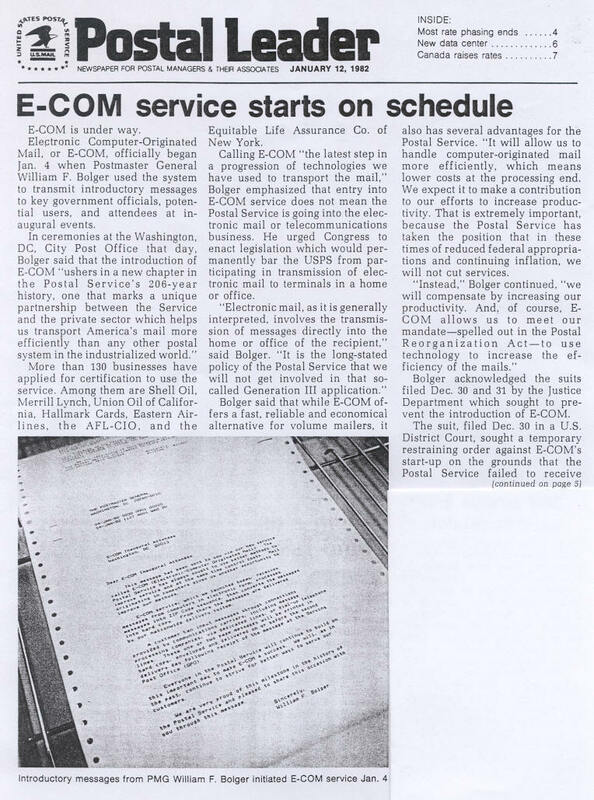 The January 12, 1982 Postal Leader confirms E-COM began on January 4th but also fleshes out some of the political problems embroiling the service. Postal Leader also has a very short squib on page 5 announcing Western Union as the first customer of E-COM in the Washington DC area. 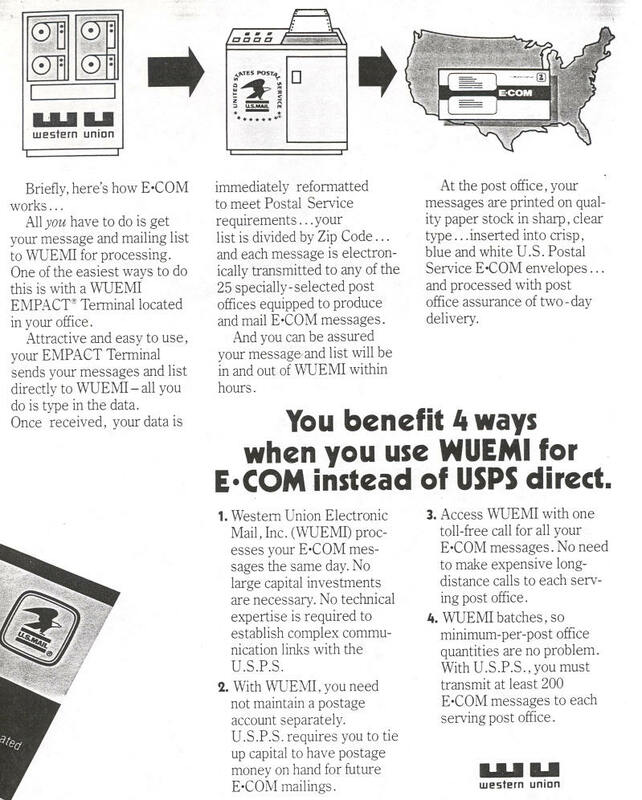 While still producing Mailgrams, Western Union became a customer of E-COM and began selling its "value-added" version of E-COM. The following Western Union promotional brochure presents a slightly different perspective on exactly who does what to produce E-COM. 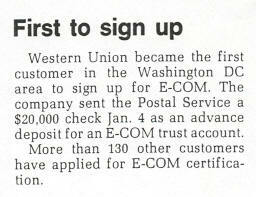 Although initially conceived as an E-COM partner, (see next scan below) Western Union had become a customer/reseller. Originally E-COM mail was to use both a red outgoing envelope and red printed stationery. Notice the 1978 copyright date and the use of Western Union to transmit and possibly prepare the data for USPS printing and delivery. 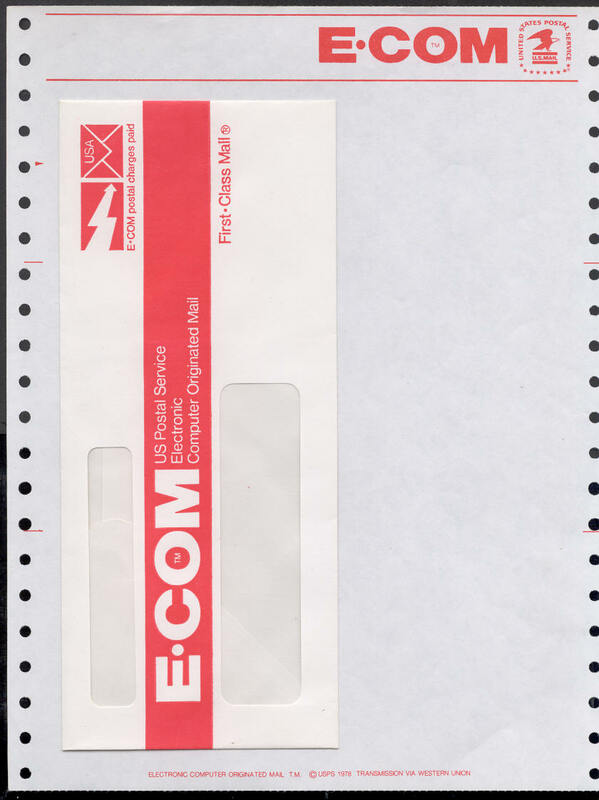 The earliest commercial usages used envelopes like the one shown on the top of the next scan. 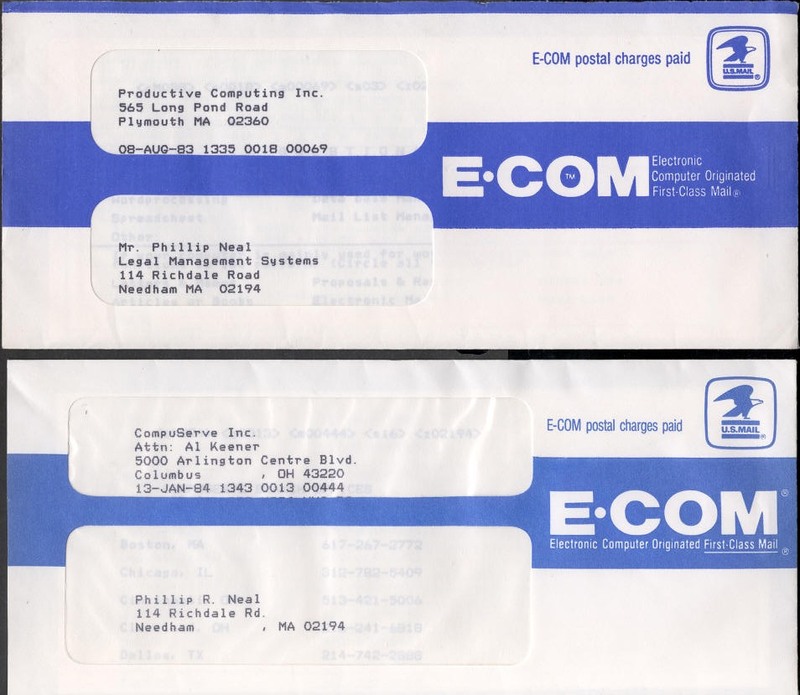 The earliest usage of the second type envelope which I have (bottom) is dated January 13, 1984. Perhaps you can provide an earlier date of the second type outgoing envelope. 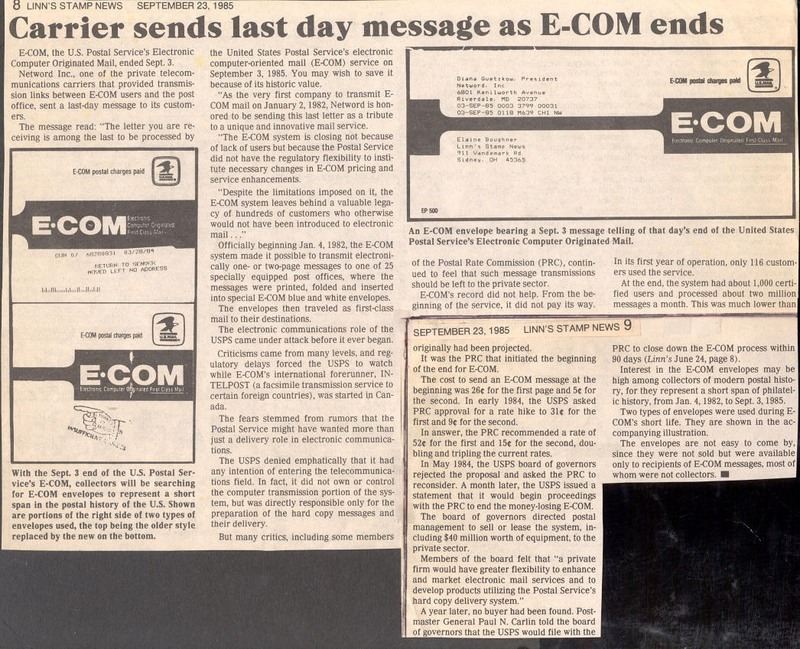 On December 31, 1981, one business day before the E-COM service was to begin, the Justice Deparment petitioned to prevent the Postal Service from offering or continuing to offer E-COM. 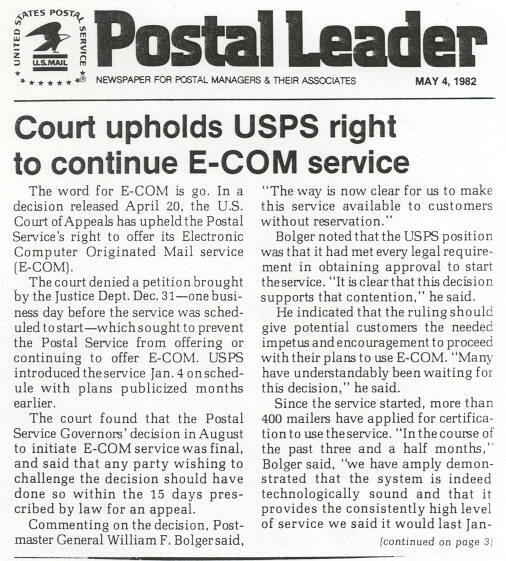 However, a decision released on April 20, 1982, stated that the Court of appeals upheld the Postal Service's right to offer E-COM. 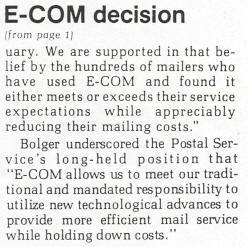 An article in the May 4,1982, Postal Leader explains the decision. Click below for the article. + page 1 and + page 3. Later articles gave a foreboding outlook however. For example, in June 1984, Linn's Stamp News reported that the service would end in 309 days. 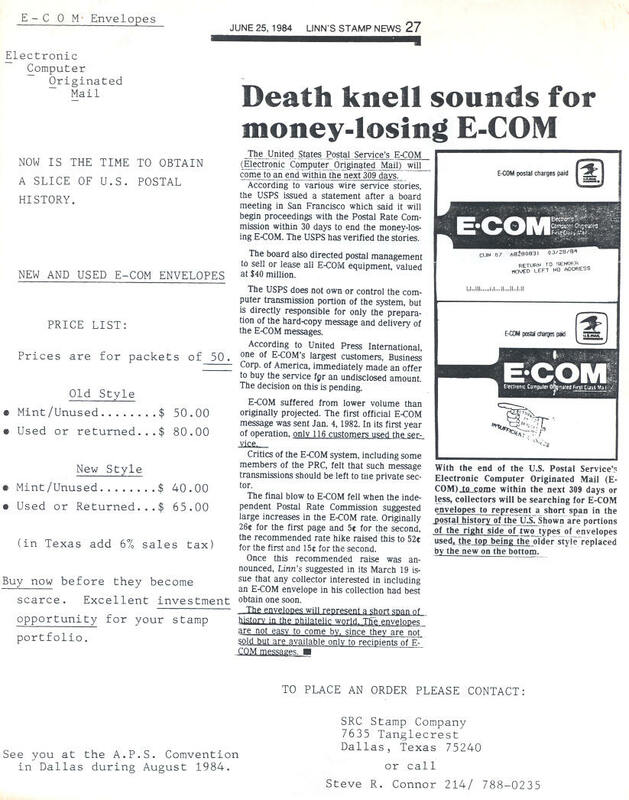 A stamp dealer used this article to create an ad offering to sell new and used E-COM envelopes of both the early and later styles. To see this ad click <here>. And in June 1985, the Postmaster General said the service would end as quickly as possible. Other companies such as MCI(MCI Mail), Western Union(Easy Link), and ITT already had electronic mail systems in operation. The September 23, 1985 issue of Linn's Stamp News says that "it's all over." Click <here> for the article. The Domestic Mail Manual revision of October 3, 1985 makes it official for the Postal Service. 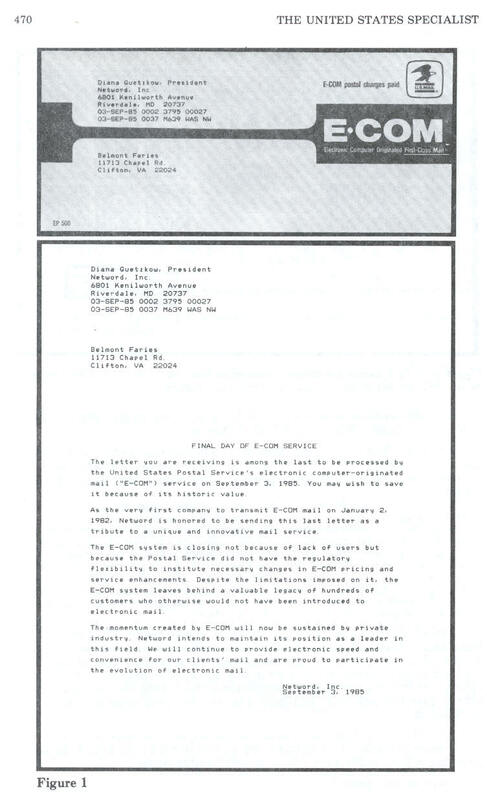 In the November 1985 issue of The United StatesSpecialist, Stuart Gitlow shared an E-COM letter sent on the final day of the service, September 3, 1985. In the letter, Diana Guetzkow, President of Netword, Inc., stated some of the problems the E-COM service had faced and indicated that electronic mail would now be continued by private industry. Click <here> for the letter.